@8:58pm c/o Northern Luzon PRSD #NL_PRSD. 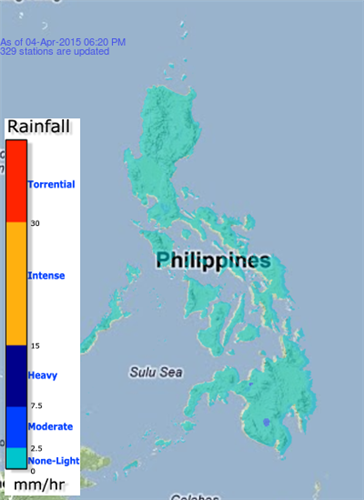 #MIN_PRSD 8:15 PM, Light to moderate #rains over #Bukidnon, #DavaoDelSur (JoseAbadSantos) and nearby areas which may persist for 1-2 hours. 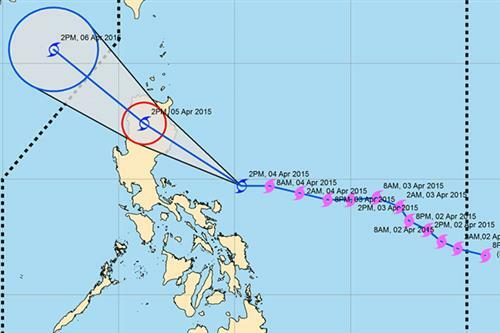 TC Update: as of 06PM today 04 April 2015, Tropical Storm #ChedengPH was located at 290 km Southeast of Casiguran, Aurora (15.2°N, 124.6°E). philstar.com(UPDATED 6:00 p.m.) State weather bureau PAGASA raised public storm signals over 26 areas as typhoon "Chedeng" (international name Maysak) weakened into a tropical storm.